Tilted Horizons: MotoGP 2009 almost here! 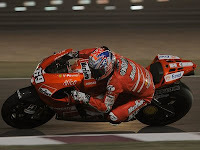 The best motorcycle road racers in the world will blast off the Qatar Grand Prix grid under the lights at Losail on April 12th, marking the start of the 2009 MotoGP season. The full schedule can be found here. The favorites going in have to be 6-time and defending champ Valentino Rossi and 2007 champ Casey Stoner, with perhaps Dani Pedrosa and Jorge Lorenzo as dark horses. The big unknown is America's Nicky Hayden, the 2006 champ. Nicky never looked comfortable on his Honda following MotoGP's switch from 990cc to 800cc engines in 2007. But 2009 will see "The Kentucky Kid" aboard a more powerful and physically larger Ducati, which should better suit his height and riding style. I'm going out on a limb and predicting that 2-time former World Super Bike champ "Texas Tornado" Colin Edwards will finally get a MotoGP win, and then come home to race in the ever-changing, ever-confounding AMA.